Ford Mustang 4.6 3 valve modular engine to fit all 05-06 ford Mustang GT vehicles This engine comes complete with the oil pan, timing cover, valve covers & new cam sensors installed. 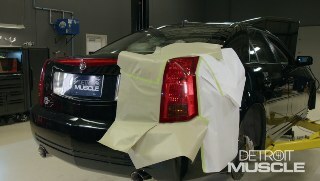 (NARRATOR)>> TODAY ON DETROIT MUSCLE WE'RE GETTING OUR FANCY PANTS ON AND TACKLING A NEW CADILLAC PROJECT. THE CTSV IS ONE OF THE MOST EXCITING MODERN MUSCLE OFFERINGS FROM THE BIG THREE, BUT WAIT AND SEE WHAT WE FIND UNDER THE HOOD OF THIS BLACK BEAUTY. (MARC)>> HEY FOLKS, WELCOME TO DETROIT MUSCLE. TODAY WE'RE OUT CRUISING AROUND IN OUR BRAND NEW PROJECT CAR. (TOMMY)>> THAT'S RIGHT, THIS ISN'T FORD, IT ISN'T A MOPAR, AND IT'S NOT A CHEVY, AND YOU MAYBE NOTICING THAT IT'S GOT A COUPLE OF EXTRA DOORS. (MARC)>> THIS IS A 2005 CADILLAC CTSV. 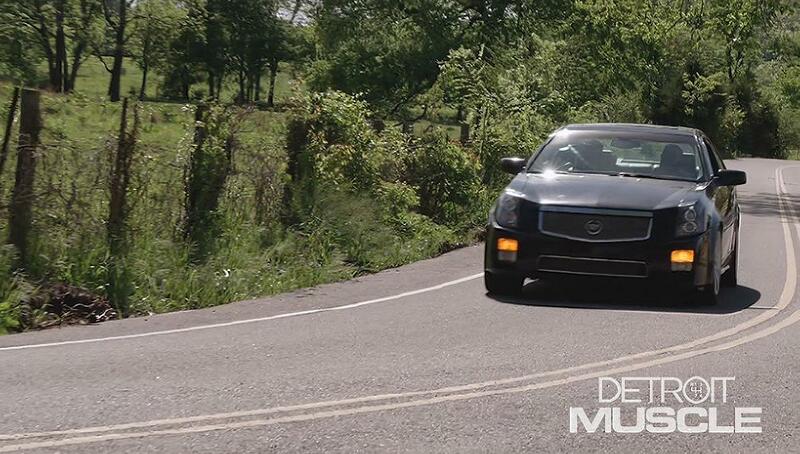 BASED ON THE ENTRY LEVEL CADDY AT THE TIME, THE CTS, THIS IS A MID SIZED LUXURY SPORT SEDAN WITH SPORTY HANDLING AND DESIGN, AND THE "V" TRIM LEVEL MEANT IT ALSO CAME WITH A 400 HORSEPOWER LS SIX BORROWED FROM THE CORVETTE ZO SIX. WHAT'S GREAT ABOUT THAT CORVETTE DRIVETRAIN IS JUST LIKE THERE'S PARTS IN THE AFTERMARKET FOR THOSE VETTES, THERE'S PARTS IN THE AFTERMARKET FOR THIS THING. I KNOW THERE'S SOME OF YOU GUYS AT HOME THAT ARE GOING, WHY DIDN'T YOU GUYS GET A SECOND GEN, THEIR SUPERCHARGED LSA? WELL THAT'S BECAUSE THOSE THINGS ARE REAL EXPENSIVE COMPARED TO THIS. EVEN WHEN THIS THING WAS NEW IT WAS ALMOST $50,000 STARTING PRICE. SO YOU COULD ONLY REALLY FIND IT IN DOCTOR'S AND LAWYER'S GARAGES, KIND OF OUT OF REACH FOR THE REGULAR GUY, BUT NOW THAT THIS THING'S OVER 10 YEARS OLD YOU CAN PICK ONE OF THESE UP FOR $15,000 OR LESS. NOW WITH THE LUXURY OF HAVING THE LEATHER INTERIOR, THE CADILLAC BADGES, INDEPENDENT REAR SUSPENSION, AND THE PERFORMANCE UPGRADES LIKE BIG BRAKES AND A SIX SPEED MANUAL, THIS THING IS FUN TO DRIVE, NOT TO MENTION THE RELIABILITY OF THE LS ENGINE. THIS IS THE FIVE POINT SEVEN LITER LS SIX. IT'S BASED ON THE ORIGINAL LS, THE LS ONE, AND DOES SHARE SOME COMPONENTS, BUT IT DOES HAVE SOME UPGRADES, LIKE MORE LIFT AND DURATION ON THE CAM SHAFT, HIGHER COMPRESSION RATIO AT 10.5 TO ONE, AND A MUCH IMPROVED INTAKE MANIFOLD DESIGN, BUT ONE OF THE THINGS THAT WASN'T UPGRADED WHEN THEY MOVED TO THIS DESIGN WERE THE CYLINDER HEADS. (TOMMY)>> NOW WITH THAT SAID, WHAT'S ON THE CAR ISN'T BAD STUFF. HECK IT'S 400 HORSE. THE DEAL IS THE AFTERMARKET HAS JUST MADE BETTER STUFF. NOW OUR FIRST PLAN OF ATTACK TO GIVE THAT CADILLAC SOME EXTRA UMP IS WITH THIS KIT THAT WE GOT FROM SUMMIT RACING. IT ALL STARTS WITH THESE TRICK ALUMINUM FULLY CNC'ED HEADS. NOW THEY HAVE A 215 RUNNER AND A 64cc CHAMBER. THE KIT ALSO INCLUDES A CAM SHAFT, THE HARDWARE, ROCKER ARMS, PUSH RODS, AND GASKETS THAT YOU'RE GONNA NEED TO DO THE CONVERSION. NOW THEY OFFER THIS IN THREE DIFFERENT SETUPS, STAGE ONE, TWO, AND THREE, AND WE DECIDED TO GO WITH THE STAGE TWO THAT MAKES 500 HORSEPOWER BECAUSE IT'S A STREET AND STRIP, AND IT WILL GO TO THE TRACK BUT MOST OF ITS LIFE WE'LL BE ON THE HIGHWAY. WE'RE GONNA GET THE HOOD OFF FIRST TO GET IT OUT OF THE WAY, AND THEN REMOVE THE STRUT TOWER BRACE. THE PLASTIC ENGINE COVER CAN GO NEXT, FOLLOWED BY THE AIR BOX AND THE AIR INLET TUBE. WE'LL GO AHEAD AND GET THE COOLANT DRAINED. THEN WE CAN START TEARING DOWN THE TOP END. (MARC)>> WE'LL START WITH THE FUEL RAIL BY DISCONNECTING IT AND GETTING IT OUT OF THE WAY. THE WE CAN REMOVE THE UPPER RADIATOR MOUNTS, AND THE RADIATOR CAN COME OUT TOO. THE COIL PACKS ARE NEXT, FOLLOWED BY THE THROTTLE BODY AND THE 10 BOLTS THAT HOLD THE INTAKE MANIFOLD ON. THEN THE INTAKE MANIFOLD CAN BE LIFTED UP AND SET ASIDE CAUSE WE'LL BE REUSING IT LATER. (TOMMY)>> THE POWER STEERING PUMP CAN BE UNBOLTED AND MOVED ASIDE, AS WELL AS THE WATER PUMP AND THE BALANCER. THE TIMING COVER IS NEXT, AND WITH A FEW BOLTS OUT OF THE WAY THE TIMING COVER CAN GO AWAY, REVEALING THE TIMING CHAIN AND OIL PUMP. (MARC)>> NOW THAT WE'VE GOT ALL OF THAT STUFF OUT OF THE WAY IT'S TIME TO GET DOWN TO THE PARTS THAT WE'RE GONNA BE REPLACING. TOMMY'S BUSY UNBOLTING THAT EXHAUST MANIFOLD OVER THERE. I'M GONNA GET THE VALVE COVERS OUT OF THE WAY, REMOVE THE ROCKS. THEN WE CAN GET THOSE HEADS OFF. (TOMMY)>> WE'VE GOT TO GET THE VALVE COVERS OUT OF THE WAY SO WE CAN GET DOWN TO THE ROCKERS. ONCE THOSE ARE LOOSENED, WE CAN REMOVE THEM ALONG WITH THE PUSH RODS AND ROCK ARM PIVOT SUPPORT. THEN WE CAN LOOSEN THE HEAD BOLTS AND REMOVE THE CYLINDER HEAD. NOW A FEW OF YOU GUYS AND GALS OUT THERE MAY HAVE BEEN NOTICING A COUPLE OF THINGS THAT WE STARTED NOTICING WHILE WE WERE TEARING DOWN THIS LS, AND THAT IS THAT SOMEONE HAD BEEN IN IT BEFORE. WHAT GAVE IT AWAY? WELL A LOT OF THE BOLT HEADS ARE KIND OF CHEWED UP. SOMEONE HAS SPRAYED ON A FANCY COAT OF ALUMINUM PAINT, AND THEN WHEN WE GOT THE HEADS OFF OF IT WE NOTICED THAT THE GASKETS HAVE BEEN SPRAYED WITH A COPPER COATING. NOW THAT'S NOT REALLY THE END OF THE WORLD BECAUSE YOU KNOW, THIS OLE CAR'S GOT SOME AGE ON IT AND IT'S PROBABLY HAD A REPAIR DONE ON IT A TIME OR TWO. (MARC)>> SO WE WERE GIVING IT THE BENEFIT OF THE DOUBT. THAT WAS UNTIL WE GOT THE CYLINDER HEADS OFF AND WE STARTED CHECKING THE CASTING NUMBERS, AND REALIZED THAT THIS IS AN ALUMINUM BLOCK FIVE THREE. LOOKS LIKE SOMEBODY JUST YANKED THIS THING OUT OF A JUNKYARD, GAVE IT A RATTLE CAN REBUILD, AND DROPPED IT IN. NOW WE GOT A KILLER DEAL ON THIS CAR, AND WE BOUGHT IT SITE UNSEEN. SO WE'LL JUST CHALK THIS UP TO DON'T BELIEVE THE SALES GUY YOU'RE TALKING TO ON THE PHONE. (TOMMY)>> SO WE'RE JUST GONNA ROLL WITH THE PUNCHES, AND STAY ON THE PROJECT, GET THIS MOTOR OUT, AND DO ANOTHER UPGRADE. (MARC)>> YOU GET TO PULLING, I'LL GET TO HUNTING. (TOMMY)>> I'LL BET MY JOB'S EASIER THAN HIS. THAT'S A LIE! (NARRATOR)>> COMING UP, WHAT DO YOU DO WHEN YOUR SUPPOSEDLY 400 HORSE CADDY COMES EQUIPPED WITH A 300 HORSE MOTOR BUT YOU ALREADY BOUGHT THE ENGINE UPGRADES? (MARC)>> WE'VE BEEN TEARING INTO OUR 2005 CTSV WITH WHAT WE THOUGH WAS AN LS SIX UNDER THE HOOD, BUT ONCE WE DUG A LITTLE DEEPER WE REALIZED THAT SOMEONE'S BEEN IN THIS THING BEFORE AND REPLACED THAT 400 HORSE FIVESEVEN WITH A 300 HORSE FIVETHREE. (TOMMY)>> BUT THAT'S OKAY BECAUSE WE'VE GOT SOME PARTS LAYING AROUND HERE FROM SOME OTHER PROJECTS, AND WE FOUND A PERFECT REBUILT ENGINE ON THE SHELF THAT'S STILL IN THE CRATE. (MARC)>> WELL TOMMY GOT OUR ENGINE AND TRANSMISSION PULLED OUT OF OUR CAR, AND THE REASON WHY HE WENT AHEAD AND GOT THE TRANSMISSION OUT WITH IT IS BECAUSE WE HAD PLANNED ON UPGRADING THAT CLUTCH TO HANDLE THAT EXTRA POWER. SO WE CAN JUST DO THAT WHILE IT'S OUT. WE ARE GONNA MOVE ON TO THIS CRATE ENGINE NOW THAT WE PULLED OFF THE SHELF. THIS IS AN LQ FOUR SIX LITER IRON BLOCK TRUCK ENGINE. IT MAKES ABOUT 300 HORSEPOWER FACTORY, AND IT'S LS ONE BASED JUST LIKE OUR LS SIX SHOULD BE. SO ALL THOSE PARTS WE GOT FROM TRICK FLOW, WELL THEY'LL JUST BOLT RIGHT. NOW THE 215cc CYLINDER HEADS ARE GONNA BE IDEAL FOR THIS DISPLACEMENT, BUT BECAUSE WE'RE WITH A BIGGER ENGINE NOW WE NEED A LARGER CAM SHAFT. SO WE'RE GONNA ADDRESS THAT AS WELL. FOR NOW WE CAN START TEARING HEADS OFF. (TOMMY)>> WHAT'S NICE ABOUT THIS SWAP IS THAT MANY OF THESE COMPONENTS ARE INTERCHANGEABLE BETWEEN THE ENGINES, BUT ALL THIS STUFF IS STOCK. SO WE'RE GONNA GET RID OF IT ANYWAYS. WE'LL GET THE ROCKERS OUT OF THE WAY AS WELL AS THE PUSH RODS. THEN WE CAN UNBOLT THE HEADS AND REMOVE THEM. THESE GASKETS NEED TO GO. THEN WE CAN GET TO THE LIFTER RETAINERS AND THE LIFTERS. WE'LL FLIP IT OVER SO WE CAN ACCESS THE OIL PAN BOLTS AND SET THE OIL PAN TO THE SIDE. (MARC)>> I WENT AHEAD AND PULLED THE OIL PAN AND PICK UP TUBE OFF OF OUR CRATE ENGINE BECAUSE THIS PAN IS DESIGNED FOR A TRUCK. THAT ENGINE IS AS WELL. THE GOOD NEWS IS THE PAN THAT CAME OFF THE ENGINE THAT WE IN OUR CADILLAC IS GONNA BOLT RIGHT ON BECAUSE IT HAS THE SAME PATTERN. SO WE JUST NEED TO SWAP OUT THE PICK UP TUBE AND PAN, BUT FIRST WE NEED TO GET THAT CAM SHAFT IN. (TOMMY)>> WE'LL GET THE TIMING COVER UNBOLTED FROM THE BLOCK AND MOVE ONTO THE OIL PUMP. WE'VE GOT TO REMOVE IT TO GET TO THE TIMING SET, WHICH IS NEXT. THE CAM RETAINER PLATE UNBOLTS, AND THEN USING A LONGER BOLT, SLIDE THE CAM SHAFT OUT. (MARC)>> IF YOU'VE GOT A THREE VALVE MUSTANG THAT'S GOT A PILE OF MILES ON IT OR JUST NEED A FRESH ENGINE, THEN POWERTRAIN PRODUCTS HAS GOT WHAT YOU NEED IN THIS FOURSIX THREE VALVE CRATE ENGINE. IT COMES FRESHENED FROM TOP TO BOTTOM, INCLUDING GRAPHITE SIDE COATED PISTONS, UPDATED OIL PUMP, AND UPDATED CAM PHASERS. THE CYLINDER HEADS ARE ALIGN HONED, AND THOSE PESKY SPARK PLUG HOLES ARE CLEANED UP. IT COMES WITH NEW SENSORS AND GASKETS, EVERYTHING YOU NEED TO GET IT INSTALLED IN YOUR RIDE, AND IT ALSO COMES WITH A FOUR YEAR MILLION MILE WARRANTY. (NARRATOR)>> STICK AROUND, NOW THAT WE'VE SOLVED OUR LS ENGINE WOES IT'S TIME TO PUT SOME POWER IN THAT SIX LITER. (TOMMY)>> HEY GUYS, WELCOME BACK. WELL WE'RE ABOUT MID WAYS READY TO GET OUT MOTOR SET OFF INTO OUR CADILLAC. MARC'S GOT THE CAM SHAFT SLID INTO THE BLOCK, AND HE'S JUST ABOUT READY FOR SOME TIMING COMPONENTS. (MARC)>> YEAH, THAT CAM SHAFT THAT WE CHOSE IS FROM TRICK FLOW'S TRACK MAX LINE. IT'S JUST A LITTLE BIT BIGGER THAN THAT STAGE TWO CAM THAT CAME WITH OUR TOP END KIT, BUT BECAUSE WE HAVE MORE DISPLACEMENT WE NEEDED MORE CAM. IT'S GOT 585 AND 585 ON THE LIFT WITH A 112 LOBE SEPARATION ANGLE. IT'S ALSO GOT 228 AND 230 DURATION AT 50. (TOMMY)>> WE'RE GONNA USE OUR OLD BALANCER BOLT TO ROTATE THE ENGINE TO TOP DEAD CENTER. (MARC)>> ALL RIGHT, THIS IS PRETTY STANDARD. WE'RE JUST GONNA MAKE SURE THESE MARKS ARE LINED UP, POINTING AT EACH OTHER. (TOMMY)>> THEN WE'LL INSTALL THE TIMING CHAIN AND CAM SPROCKET, AND TORQUE THE BOLTS. THAT OLD BOLT CAN BE REMOVED AND THE OIL PUMP REINSTALLED. (MARC)>> NOW BEFORE WE CAN TIGHTEN THESE BOLTS THAT HOLD THE OIL PUMP ON WE'RE GONNA GO AHEAD AND USE THESE FEELER GAUGES TO STICK INSIDE BETWEEN THE ROTORS OF THE PUMP. THOSE ARE TWO THOUSANDTHS EACH, AND WHAT THAT'S GONNA DO IS CENTER THE PUMP UP ON THE ROTOR, THAT WAY YOU DON'T GET ANY PREMATURE WEAR ON THE ROTORS. (TOMMY)>> THEN WE CAN TORQUE THOSE OIL PUMP BOLTS AND REMOVE THE FEELER GAUGES. (MARC)>> THE PICK UP ORING NEEDS TO BE LUBED, AND THEN INSERTED INTO THE INLET OF THE OIL PUMP. THEN THE RETAINING BOLT GETS INSTALLED AND TORQUED DOWN. WE ALSO NEED TO TIGHTEN THE NUT THAT HOLDS THE PICK UP TUBE BRACKET. A LITTLE RTV ON THE SEAMS AND WE CAN INSTALL OUR OIL PAN GASKET AND OIL PAN. WE'RE TAKING CARE TO SNUG OUR OIL PAN DOWN IN SEQUENCE SO THE GASKET SEATS PROPERLY. THEN WE CAN TORQUE IT DOWN IN THE SAME SEQUENCE AND MOVE ON. A LITTLE MORE RTV ON THE SEAMS AND THE TIMING COVER CAN GO ON AND BE TORQUED DOWN. (TOMMY)>> WE GOT A NEW SET OF CHEVROLET PERFORMANCE LIFTERS FROM SUMMIT RACING, WHICH WE SOAKED OVERNIGHT. THEY GO IN WITH NEW RETAINERS AND GET TORQUED DOWN. IT'S ALWAYS A GOOD IDEA TO PAIR A NEW CAM SHAFT WITH NEW LIFTERS WHILE YOU'RE IN THERE, JUST FOR A LITTLE PEACE OF MIND. (NARRATOR)>> STILL AHEAD WE FINISH OUR LS ENGINE UPGRADES. (TOMMY)>> WELL WE'VE GOT THE HEAD CINCHED DOWN AND MARC'S FINISHING TIGHTENING UP THE ROCKERS ON THAT SIDE. I'VE GOT TO DROP A COUPLE OF PUSH RODS DOWN ON THIS ONE AND BOLT IN THE ROCKERS AS WELL. NOW WE'RE GONNA GO AHEAD AND BOLT ON THE FRONT ACCESSORIES WHEN WE GET FINISHED UP HERE SO THAT WE CAN KIND OF DROP A MAJORITY OF THE WORK ALREADY INTO THE HOLE AND NOT HAVE TO DO IT HANGING OFF THE FENDERS. (MARC)>> THE NEW PUSH RODS GO IN THE HOLES, AND WE'LL ADD A FEW DROPS OF ROYAL PURPLE MAX TOUGH ASSEMBLY LUBE ONTO THE TOPS OF THEM AND THE VALVE STEMS. THEN THE ROCKERS GO ON AND GET TORQUED DOWN. WELL WHILE TOMMY'S GETTING THOSE VALVE COVERS ON LET'S TAKE A LOOK AT SOME OF THE THINGS WE GOT TO PUT ON OUR LS ENGINE BEFORE WE GET IT BACK IN THE ENGINE BAY OF OUR CADILLAC. WE WENT TO ROCK AUTO DOT COM FOR A BUNCH OF WEAR ITEMS, LIKE THESE ENGINE MOUNTS, NEW INTAKE MANIFOLD GASKETS, ALL NEW BELT DRIVE WITH PULLEYS, TENSIONERS, AND BELTS, WE DECIDED TO UPGRADE THE COOLING SYSTEM WITH A NEW WATER PUMP, THERMOSTAT, AND HOUSING, AS WELL AS UPPER AND LOWER RADIATOR HOSES, AND WE ALSO GOT THIS NEW COOLANT TANK BECAUSE OUR COOLANT LIGHT WAS STAYING ON, AND THIS SENSOR TELLS YOU WHEN YOUR COOLANT'S LOW. IT'S BUILT INTO THE TANK AND OURS WAS BAD. SO THAT'S THE ONLY WAY TO REPLACE IT. WE ALSO NOTICED THAT THE HIGH PRESSURE POWER STEERING HOSE WAS LEAKING. SO WE GOT ONE OF THOSE AS WELL. FIRST THING, THIS WATER PUMP. (TOMMY)>> THIS IS AN OEM REPLACEMENT PUMP, AND IS A DIRECT REPLACEMENT FOR OUR CTSV. LIKE MANY OF THESE OTHER COMPONENTS, IT SHARES THE SAME GEOMETRY WITH OUR SIX LITER. THIS NEW HOUSING AND THERMOSTAT GO TOGETHER AND SLIDE RIGHT INTO THE NEW WATER PUMP. (MARC)>> NOW IF YOU'RE WONDERING WHY WE'RE REPLACING ALL THESE PULLEYS AND TENSIONERS RIGHT NOW IT'S BECAUSE THEY'RE PRETTY INEXPENSIVE TO REPLACE, BUT THEY CAN KIND OF BE A PAIN TO GET TO WITH THE ENGINE IN THE CAR. SO WE WENT AHEAD AND ORDERED THEM ALL AND WE FOUND ONE. THIS WASN'T MAKING A NOISE WHEN THE ENGINE WAS RUNNING BEFORE, BUT NOW THAT WE'VE GOT IT OUT WE CAN TELL IT'S MAKING NOISE. THAT ONE'S BAD. (TOMMY)>> HEY BIG MAN, WHERE WE AT WITH THIS LS? (MARC)>> IT'S GETTING CLOSE. WE'VE GOT TO GET THE ENGINE MOUNTS ON THERE, AND WE MIGHT AS WELL SWAP OVER SOME OF THE SENSORS, AND SOME OTHER STUFF BEFORE WE GET IT IN THERE, AND I THINK WE SHOULD GET SOME TAPE OVER THESE INTAKE RUNNERS SO WE DON'T DROP ANY BOLTS IN THERE. (TOMMY)>> THAT'S PROBABLY A PRETTY GOOD IDEA. NOW WE DIDN'T GET AS FAR AS WE WAS HOPING TOO. WE WAS HOPING TO DROP IT INTO THE CADILLAC BUT WITH THAT CURVE BALL THAT IT THREW US, WELL WE STILL GOT QUITE A BIT DONE BECAUSE YOU ALL KNOW WHENEVER YOU GET KNOCKED DOWN, YOU KNOW WHAT YOU'RE SUPPOSED DO RIGHT? (MARC)>> GET BACK UP AGAIN. (TOMMY)>> THAT'S RIGHT. IF YOU'VE GOT A '79 TO '93 MUSTANG, THEN YOU KNOW IT'S A POPULAR PLATFORM AMONGST THE PERFORMANCE ENTHUSIAST. ONE WAY YOU CAN MOVE UP THE CAPABILITIES OF THAT PONY IS WITH THIS KMEMBER FROM QA ONE. FIRST OF ALL THIS THING'S GONNA SAVE YOU 28 POUNDS, WHICH ALWAYS MEANS MORE SPEED, BUT WHERE THIS THING REALLY SHINES IS IN ITS IMPROVED SUSPENSION GEOMETRY, WHICH IS GONNA GREATLY INCREASE YOUR HANDLING. IT ALSO GIVES YOU MUCH BETTER HEADER CLEARANCE AS WELL AS HAVING AN EASY DIRECT BOLT ON DESIGN. YOU CAN PLUG IN YOUR STOCK CONTROL ARMS OR UPGRADE TO AN AFTERMARKET SET FOR ADDED CAPABILITIES. NOW THIS THING COMES TO YOU POWDER COATED AND READY TO BOLT IN UP UNDER YOUR CAR. NOW THIS IS A PRETTY BIG UPGRADE AS WELL, BUT IT'S PRETTY REASONABLY PRICED AT $365 BUCKS. (MARC)>> HEY FOLKS, NOT TOO LONG AGO I SHOWED YOU HOW TO TAKE A PROPER PHOTO OF YOUR CAR. NOW THERE'S A LOT THAT GOES INTO THAT, LIKE LOCATION, AND POSITIONING OF THE CAR, AND YOU WANT TO MAKE SURE THE CAR IS CLEAN, AND THINGS LIKE THAT. LIGHTING IS REALLY IMPORTANT. NOW WE JUST SHOWED YOU ONE PHOTO, AND THAT'S GONNA BE THE FRONT THREE QUARTER LIKE WE HAVE THE CAR SETUP FOR HERE, BUT THERE'S MORE THAN THAT IF YOU WANT TO GET A FULL SET OF PHOTOS FOR YOUR CAR, AND TO SHOW OFF SOME OF THE DETAILS WE'RE GONNA SHOW YOU HOW TO DO THAT TODAY. WELL WE ALREADY COVERED THE FRONT THREE QUARTER. THIS IS CALLED A REAR THREE QUARTER. WHAT'S GREAT ABOUT THIS IS JUST LIKE A FRONT THREE QUARTER SHOWS OFF THE BEST ANGLES OF YOUR CAR FROM THE FRONT, THIS SHOWS OFF THE BEST ANGLE OF YOUR CAR FROM THE REAR. YOU ALWAYS WANT TO TAKE THE BODY LINES OF YOUR CAR INTO CONSIDERATION. SO IF YOU'VE GOT A SPORTS CAR LIKE WE'VE GOT HERE, YOU WANT TO MAKE SURE YOU ACCENTUATE THOSE BODY LINES RATHER THAN HIDING THEM. IF YOU ACCENTUATE THEM THAT BRINGS ATTENTION TO THEM, AND THAT MAKES A BETTER PHOTO. PERSPECTIVE, WHEN YOU'RE TAKING A PHOTO OF SOMETHING DETAILED ON YOUR CAR PERSPECTIVE IS VERY IMPORTANT. IN A PHOTO LIKE THIS ONE YOU SEE HERE IT'S NOT IMPORTANT THAT YOU CAN'T TELL WHAT KIND OF CAR IT IS BECAUSE THE SUBJECT OF THE PHOTO IS THE REAR WHEEL AND TIRE. SO THIS PHOTO'S JUST FINE. NOW IN A PHOTO LIKE THIS THE DETAIL ACTUALLY GETS LOST IN THE SIMPLICITY. YOU CAN TELL IT'S THE TAIL LIGHT, THAT'S ABOUT IT. SO IF YOU DO WANT A DETAILED SHOT OF THAT TAIL LIGHT YOU CAN DO IT, YOU JUST NEED TO PUT IT IN PERSPECTIVE USING ANOTHER CHARACTERISTIC OF THE CAR. SO WE'RE GONNA MOVE OVER TO THE SIDE AND GET THIS BADGE IN THE SHOT. ANOTHER OPTION FOR A FULL BODY SHOT OF YOUR CAR WOULD BE THE SIDE PROFILE. YOU CAN ALSO DO A FRONT OR REAR PROFILE AS WELL, BUT ON THAT SIDE PROFILE IT REALLY SHOWS OFF THE OVERALL BODY LINE OF YOUR CAR. IT WORKS REALLY WELL WITH OUR CORVETTE BECAUSE IT IS SO AGGRESSIVE AND IT HAS THAT LOW STANCE. THE NOSE OF YOUR CAR IS LIKE ITS FACE. IT'S THE MAIN CHARACTERISTIC THAT DETERMINES YOUR CAR'S PERSONALITY. SO YOU WANT TO MAKE SURE YOU GET SOME PHOTOS OF IT, SHOW IT OFF.